A very successful unmounted training session was held at the beginning of May at Alvingham. Everyone seemed to enjoy themselves, the weather was very kind (it stopped raining before the walk, the sun shone during the walk & the rain started again about half an hour after everyone had set out for home), no-one got lost &, by the end, everyone seemed to be very comfortable using a compass as well as the map. Well it was my first ever experience of TREC and I have to say it could not have been a better one! This event wasn't on my doorstep but the effort was worth it. I went hoping I may find an activity that myself and my young horse would enjoy and it appears I have. My partner came along for the drive and even he enjoyed it and has signed up for the supporter membership. Thank you to Jane and Caroline for sharing their knowledge in a way that encouraged rather than discouraged. I feel totally at ease about attending the up and coming map reading event to be held at Willingham Woods and cannot wait to attend the PTV training day with my horse on 28/6/15. To anyone who wonders what TREC is all about all I can say is come along and find out. It's friendly, you can have a go with an “at your own speed” approach so as to stop you feeling out of your depth but most of all it was and is going to be FUN !!!! I attended a POR training day with Trec Lincolnshire on a very wet Saturday afternoon. I wasn't sure what to expect but after a nice welcome and intro. we set off with compass and a marked route on the map. We had to navigate by taking readings from the map with our compass and alter our course accordingly. Before starting, we had counted out how many strides it took for 100m. Part of the way along the route, we were given instructions for the next part. We now had to work out when to turn using the number of steps needed to cover the distance and then use take compass readings before actually making a turn required by the route on the map. Sounds complicated and at first it was but, with guidance and practise, I soon got the hang of it. Need to carry on practising though! These skills can then be put to use in the POR phase of a Trec competition. Had a really enjoyable time and totally forgot about the rain!! A great day and this time the weather was kind to us! Jane and Caroline gave expert help during the training session in the morning. They explained what the judges would be looking for at each obstacle and gave us tips on how to get the best marks. We then had free time to practice the obstacles. After a picnic in the car park it was down to serious business.... The competition! Everything ran perfectly to time, a few of us took the maximum time allowed for the course but everybody completed it in one piece. It was a great friendly atmosphere. After taking the ponies back to the trailers we all helped clear away the obstacles and Jane and Caroline totted up the scores. Then there was a presentation, the scores were announced and rosettes issued. 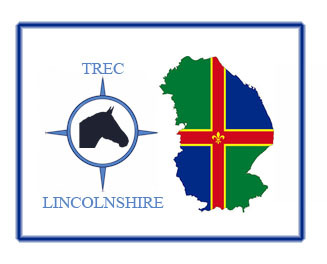 All told it was a great day and I hope Trec Lincolnshire will arrange more days like this. I found the unmounted training session in Temple Wood really useful and would definitely recommend it to anyone interested in improving their Trec POR skills. Both Caroline and Jane were excellent at explaining map reading and using a compass; they also gave lots of practical tips for orienteering in woodland. They are excellent tutors with endless patience. I would attend another session if it were organised. Castledyke proved to be an excellent venue for our training day. The use of cross country banks and water made for some interesting and challenging obstacles for horse and rider. We all gained more experience and knowledge from Jane and Caroline with their insight into tackling obstacles such as the S-bend and Clover Leaf and how to ride steps etc. We had the opportunity to try the different elements in several gaits to find the best option for us and our horses. After a break for bacon butties, we were given an insight into map room etiquette, and advice on riding as both a pair and singularly. After drawing the route, we headed out following it, as best we could, looking for marker points along the way and trying to ride at a specified speed. Some of us doing this rather better than others!! (After we made a small 'detour'.) It was a great day out, many thanks to all involved in the organising and setting up of the day, looking forward to the next one. Thank you Jane, Caroline & helpers for arranging a great ride. I clearly need more map reading training seeing as I went so horribly wrong and only managed one check point! Even though I didn't do the intended route I thoroughly enjoyed the afternoon. Thank you for organising yesterday at willow banks. Great fun can't wait for the next one. Cae and I had a great day thanks to all for all the planning and organization. Thank you so much for today! We REALLY enjoyed it and Lily loved her relaxation therapy! I do have a 3rd rosette though that should be a 4th, will keep it safe and bring it back on the 5th December, I should have checked more carefully. Everybody is super-friendly and I really appreciate all that the judges and helpers do. Sorry for dismantling the course on a couple of occasions! Thank you to everyone for today at Kenwick. All the judges, Jane and the other participants. Fun day with a nice bunch of like minded people. Look forward to the next one. A big thank you to everyone who worked so hard to organize the event today.It was our first ever try and we now know what we need to do to improve! I came to see what it was all about today and I was very impressed with how friendly everyone was - I was wishing I had entered my yak after all! I took some photos you guys might enjoy seeing - feel free to use any you like. I will be joining the group and will see you all at the next one! Thank you Jane, Caroline and all helpers for making a fab day possible. I really enjoyed it and will be coming again with my old boy. Thank you again to Jane, Caroline and the judges for another great day. I was thrilled to get my first red rosette. Sonny and I thoroughly enjoyed the day. Lovely to see some new faces and although this is only my second competition I was pleased to be able to help others. This really is a great friendly club and I am proud to be a part of it. Fab day thanks Jane and Caroline and all your helpful volunteers, great day again! Thank you to everyone at today's Le Trec our first time we loved it, everyone was very friendly, when's the next one? Lovely day and lovely cheerful faces, judges... just wondering how many miles you all walked today in the course of your judging! Thank you very much for all your hard work, much appreciated!!! I'd just like to say how much I enjoyed today's Judge training event. The format of learning the rules and requirements via slide show sitting in the warmth then implementing this in practice with horses and riders then finally practice judging ourselves made it really interesting from start to finish. I'm sure I speak for all of us in giving Jane and Caroline and the team a huge vote of thanks for their time and effort setting up these events - it is very much appreciated. I thoroughly recommend the event to anyone and suggest you get yourself on the next one - you'll be glad you did! Judge training today was extremely well thought out and interesting. Thank you. Thanks for a great day. Enjoyed meeting some people today and their fab horses. Look forward to the next one. My first time too today, and I'd also like to thank Jane and Caroline and the team for being so helpful and supportive, and for putting up with me asking dumb questions at regular intervals! I really enjoyed the day and was so pleased with my horse Rio - see you all at the next one! Invaluable for BHS trained Trec judges to refresh their skills so become TREC GB accredited and to anyone who’d like help with the competitions. Great training today, thank you. Very chuffed with my rosette as well! Thank you Jane & Caroline for a friendly and informative judges training session. Thank you to Sue and Donna-Marie for riding for us and letting us comment on your deliberate mistakes. Must say I had a fantastic time at my first Le Trec clinic. loved meeting Kitty, pearl and their riders. Everyone rode really well. Thank you Jane and Caroline for a great training session today. Loved the low branches and we can now do the S bend mounted without trashing it! Thank you to the organisers and volunteers at this weekends competition, shame about the rain on Saturday. Biggerside Eloise and I enjoyed trying something different. The other competitors were very friendly and helpful. Next time we will have more insight and do our homework, it is far more challenging than I thought but good fun. Despite the rain on Saturday the POR route at Asgarby was very enjoyable that is at level one!!!. I was so glad I had invested in waterproofs and a decent map case .I cant imagine how the level 3's sorted the grids and bearings in that rain . The PTV was great fun with the sunshinse and the ground so inviting for a gallop ! Pity about the obstacles to be completed on the way , A big thank you to all the organisers and helpers/judges without whom we would not have such a good time , I think I'm in danger of getting hooked on this very friendly sport !! Thank you so much Jane and Caroline and everyone who helped to make the Asgarby trec a great success.Your hard work is appreciated so hope your get a bit of alcohol tonight Jane ! Home after a weekend of TREC in Lincolnshire with Wooda. Yesterday it rained incessantly (and unnecessarily heavily in my opinion) ALL day while we did 6 hours of POR. Not sure if the TD has a sadistic streak (thanks Jane!) but we had not one but two grid reference sections, with a total of 16 points to plot. Not to be enjoyed in those weather conditions. How the f*** to keep the map dry? However necessity is the mother of invention and we improvised well enough to get home eventually with only time penalties. Today dawned with a lovely sunrise (after my one off never to be repeated night in a tent) and the weather was blue sky and sunny. Wooda and I enjoyed the extra long 5km PTV enormously, with fab canters occasionally interrupted by obstacles. No idea where we were finally placed but great to be home and starting the task of drying everything out. **edited to add I was placed 3rd, just seen results on web (thanks Trec Lincolnshire). A million thanks to Ailsa Gibson and Guiness for letting Wooda share their horsebox to get home. Fi and Humbug had claimed the horsebox for a local dressage Championship show - just as well as they won their class! Just wanted to say a huge thank you to the organisers, land owners, volunteers and fellow competitors for a really fab weekend. The ride was absolutely fabulous, lovely ground that was easy on delicate hooves! The rain was certainly a challenge for my first Level 3 and how I got back with such a disintegrated map is beyond me, but it proves my navigation must surely be getting better! Thanks again everyone and hope to see everyone up there again next June! POR would have been perfect if not for the weather (somehow we survived!) but an excellent and testing PTV round the farm with fantastic views of the Boston Stump. Thanks to Caroline Forrester and Jane Scott and all their helpers for making everyone so welcome and running such an enjoyable Trec. I would like to add my thanks to Jane, Caroline and the kind land owners who went to such trouble to make super courses Saturday and Sunday. Such a lot of work but much appreciated by those of us who took part. Rosie now having a much deserved rest! Thank you for a great competition this weekend. Thanks to Caroline and Jane, all your helpers and your lovely land owners. All your hard work is really appreciated. The online entries were brilliant, very easy to use. The POR was very enjoyable despite the persistent rain and having two lots of grids to plot! a lovely route. The PTV was amazing having a 5km mown track to follow making use of the natural undulating terrain, headlands, woodland with 'local obstacles' and a 25 minute time limit.